We're in Big Sur, where it is drippy and rainy and we are sitting on the drippy and rainy patio of a dumpy but okay motel because the children are sleeping in the dumpy but okay motel room. I looked over and they were snuggled together in the bed and for an instant I enjoyed the illusion that they actually like each other. 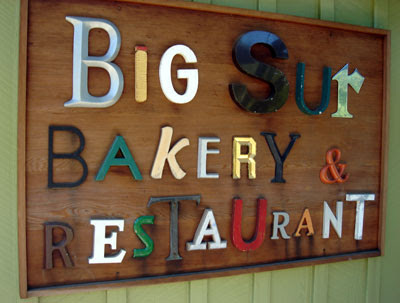 We're taking a few days off to drive down to Los Angeles and Legoland and made a detour to Big Sur strictly so I could eat at the Big Sur Bakery, which I read about last year in the New York Times Magazine and have wanted to visit ever since. I appreciate my husband's forbearance; he couldn't care less. Actually, the children care less. We sat down and Owen said, "Do they have hot dogs?" It's a sweet, rustic, hand-crafted kind of restaurant, and our beautiful waitress wore pigtails and looked like a milkmaid, if milkmaids went to college. You know how there are women who seem born to be someone's Muse? She was like that. The restaurant's male clientele had either shaved their heads and were sporting precise, arty little goatees, or had lots of leonine hair and beards and talked and laughed really loudly and lustily. They looked like they were all heavy-drinking heterosexual oil painters, or trying to emulate heavy drinking heterosexual oil painters because heavy drinking heterosexual oil painters have more fun. I'm trying, probably unsuccessfully, to capture the ambiance of this place, which was fascinating. Needless to say, we did not fit in. The food was straight-ahead Alice Waters-style, ingredient-driven, strenuously simple, "let the underlying favors speak," and so on. I like that. They ran out of bread, which was a bad thing for a bakery to do. The kids' pizzas had skinny, blistered crusts and were topped with non-stingy quantities of fresh mozzarella. The beet salad was nice. The wood-roasted cod was scrumptious. My husband didn't like the menu: "Whenever I order the risotto it means there's nothing I really want." I know what he means; there was nothing on there that I couldn't or wouldn't cook at home, but I don't ordinarily mind that. The thing that struck me was the prices. A dish of olives was $6.50, which is a lot for something other restaurants present for free. I expected to pay in the $20s for entrees here, which we did and which seemed fair, but the salads -- plain, austere salads -- were all around $14. I'm not complaining, or maybe I just know better than to complain. I know that a restaurant like this is a labor of love and the love is definitely there and no one is getting rich and everything we ate was lovely and you have to shell out for properly produced, immaculately prepared food. I'm just noting, for the record, that I can make, and have made, an organic, local beet salad at home for, I don't know, $2? At prices like the Big Sur Bakery charges you just want a tiny bit more pizzazz from a beet salad. Or I do. If I didn't cook, maybe I'd feel differently. The jelly donuts are supposed to be mind-blowing, but I suspect they're all gone by now. In Mark Bittman's article 101 Salads for the Season, #49 was: "Toss greens with walnuts, blue cheese and raspberries; drizzle with a simple vinaigrette. Sell for $14 a serving." I prefer to get things out that I can't/won't do at home, so I can empathize with the weird feeling you had. Hey, you must be driving through my town, Newport Beach. Sadly, I can't think of any restaurants to recommend. (My dining out options are severly limited by my 3 and 6 year olds.) I can, however, strongly recommend visiting a local plant nursery called Rogers Gardens. It's really a one-of-a-kind place. Pricey, but very fun to stroll around in, especially during Christmas time. Your description of the men in the Big Sur Bakery is so funny and perfect. I love your writing, which is why your blog is my favorite of all food blogs. You're never precious, which is refreshing in the very precious world of food blogs. And I don't just mean your language isn't precious. If you made an apple pie, there would not be an arty, shallow focus shot of apple peels in an earthenware bowl. If there was a photo at all, it would be a hastily taken snapshot, and it would be a little messy, because cooking is messy and so is life. And I come here for the mess. I mean that in a good way. I like this blog because the comments are always complimentary or complementary! Go, blog!